Walk In shower enclosures are to the shower world what a long soak is to those whom love a long bath. 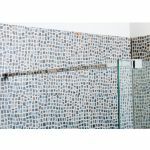 In fact many people are swapping baths in favour of a walk in shower since they look great and offer better accessibility. The design generally incorporates 1,2 or 3 glass screens with little or no moving parts to go wrong. Panels are available for installing in a wet room or mounting on tray from as small as 500mm. Many matching trays incorporate a drying area so water never has to leave the space. SEUK have models for all bathrooms that will fit in a corner location, in a recess space between 3 walls or even on a single wall. Walk in showers tend to be on the larger side. Before purchasing insure you measure up correctly. It's not just a case of fitting the screen and tray in but making sure it will still be comfortable to use other hardware such as a basin or toilet that might be close by. If you're replacing a bath, like for like in size, the process should be easier. Don't forget to check the height you have available. Walk in screens start at 1850mm and can go above 2000mm. On top of a raised tray installation the overall height could be 2160mm. Measure twice. You can create a walk in shower with one, two or three screens. A single screen will be good for a recess or alcove. With a corner you can suit yourself but more screens means less chance of a wet bathroom floor. Flipper panels are proving very popular at the moment. Some are fixed while others can rotate to either extend a main screen or create a dogleg to deflect water back into the shower. 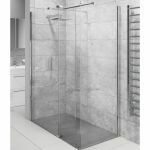 Showers are available in various thicknesses of glass. These include 6mm, 8mm and 10mm. Understand that thicker glass is generally more expensive and also heavier. The weight can make it more difficult for you to handle and for a fitter to install. Glass is available in various finishes such as clear, tinted and frosted. You can choose based on the type of look you want to create. Frosted and tinted finishes can offer a small degree of privacy. 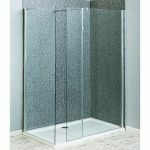 Walk In shower screens make use of a rectangle tray or dedicated walk in. Walk in options usually incorporate a slightly raised drying area with channels to drain water. These offer slip resistance and are particularly useful for elderly persons.